A bunch of white men behind me, well into their 60’s are braving the weather - more than happy to wait two hours on their day-off to show up for a presidential candidate - only this it’s time a black woman from California who the day before bragged about her pot-smoking college days, where she listened to Tupac & Snoop Dogg. It’s a freezing Monday in Portsmouth, New Hampshire - a diverse crowd packs into Old North Church. Senator Kamala Harris is late - the room eagerly anticipates her arrival, which comes less than 3 weeks after announcing her bid for the white house. Heavy snow is falling outside. Students of all colors are seated behind where she is to speak, all given ‘Kamala Harris for the People’ signs. ‘All We Got’ by Kanye & Chance the Rapper is playing. Her platform is what Senator Bernie Sanders appealed to in 2016, the liberal ‘fringe’ that is now the “political mainstream.” She’s a social justice seeker; both pro-choice and pro-affirmative action, vowing to fight for people of all walks of life. She’s an environmentalist who just announced support for the Green New Deal. She brags to be a law-and-order candidate - as a District Attorney, Harris looked to clean up “surgically precise racism” and a broken prison system. She’s not a socialist, but, despite supporting universal healthcare and higher taxes on the wealthy, believes in free market capitalism. She rose to fame pressing Brett Kavanaugh on the Senate Judiciary Committee, and has been the first major candidate to call the President a racist explicitly. You have to win New Hampshire if you want to be the nominee - but its residents won’t vote for over a year. 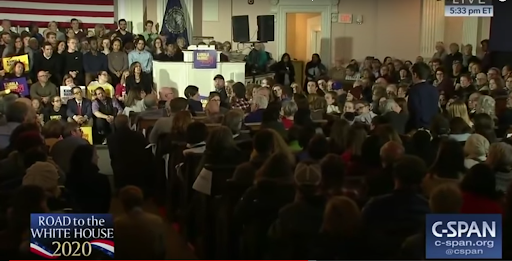 Regardless, microphones are positioned in the crowd for eager “granite state-ers” to voice their grievances. They came prepared. Harris’ energy was a vibe. She walked in to ‘T-Shirt’ by Migos, bursting into the LGBT pride-flagged-draped, old New England church all smiles and excitement - an eagerness for the job at hand. Her 5’2”, pantsuit with sneakers self is visibly human, and it’s early on in a brutal process - but she’s having fun, enjoying every minute of it. Kamala is as cool as they come. Her first question comes from a mom in the front row whose son has a life threatening disability, and while he grows, the bills follow. Harris is not a biological mother herself (though twitter dubs her momala) but here she acts like one. They have a human exchange, heavy in eye contact - as was her answer in substance, “Thank you for being so brave as to share that.” She then gave over five minutes worth of statistics and concrete information as supplement - citing a bill she had supported in the senate to take drug companies’ patents if they abuse price mark-ups. Obviously i’m not a grieving mother against gun violence, a seventy year old union worker trying to make ends meet, or an illeagal immigrant fearing my future outside the lines of D.A.C.A. (all of which spoke), but I was lucky enough to ask Senator Harris some questions, which I plan on trying at every rally I attend until election day 2020, (if I’m able to). When I was writing my first article for PrideTime, I researched the mental health epidemic - what I found was staggering. It’s troubling, clear and present, yet most candidates don’t have a platform for doing much about it. This question was important to me, and led to our best exchange. “Suicide rates over the last 15 years or so have steadily been on the rise, partly because of the many shortcomings the mental healthcare system offers its patients. What as president would your administration would do to change this?” I ask. Harris made a great effort to keep eye contact. She nodded along as I spoke - maybe it was just being a politician, but it felt genuine - I have to say. “Yes, definitely - well that’s a great question, thank you for sharing that. I feel very strongly that we should have a national policy on mental healthcare, and substance abuse treatment - on demand.” She later detailed how she would implement this, “we as a country have not created enough resources, or incentivized for people going into those professions,”... “especially the rural areas of our country, which have some of the highest need for that treatment.” She promises to back telemedicine, that mental health would be a priority for her - especially under the umbrella in her proposed medicare system. It’s early. It will be a long campaign. But all I could think about was who her party put forward last time around. Hillary never made me feel good. She just didn’t have that exciting ethos around her - had I asked her that same question, I know it wouldn’t have really mattered to her. Politicians are essentially actors, obviously, but Mrs. Harris’ showed me she really took interest, on a personal level, especially by urging me to follow up. Even if I might not necessarily agree with her on policy, she was ostensibly passionate, hopeful about what this journey could bring her, and what she could bring to a country full of people just like me - who are just looking for answers. All subjectivity aside, I would be an objectively proud American and first voter if the KKK-backed, “grab ‘em by the p---y” President was forced to debate a gangsta rap & weed indulging black feminist (who walks out to Migos), for his job.